To call o ya a “sushi place” is to sell it incredibly short. Chef Tim Cushman’s menu is heavy on sashimi and nigiri, yes, and you will find hamachi, eel, and miso soup on the menu, but there are no spicy tuna rolls, seaweed salads, or sticky soy sauce bottles. Instead, you choose between sake – braised short ribs, duck tataki with foie gras, or Kumamoto oysters with watermelon pearls and cucumber mignonette. Try not to miss the Kikkoman. Try not to miss the door either, relatively hidden down a small side street in Boston’s leather district. Just a block from Les Zygomates and Sorriso, the view from o ya’s counter is a dingy brick alley, but the restaurant is anything but shabby. And, as our waiter pointed out, there is a lot of reading involved in a meal here. The menu is tapas style, which for sushi translates to 2-3 bites on each plate, so you’ll have to wade through the long list of options to get your fill. Or, you could take the lazy way out and get the tasting menu. We were lazy. O ya has two tasting menus, one promoted as sort of the American Express Black Card version (heavy on the Wagyu beef and truffles), and the other as a “greatest hits” of the existing menu. We chose option 2 – our menu is recreated at the link below, to the best of my recollection and with help from their online catalogue. Each course arrived shortly after the next, but we were far from rushed. From our seats at the counter we watched the sushi chefs torch our salmon, arrange strings of miso on top of hamachi, and top fried oysters with squid ink foam. The quality of each ingredient was unparalleled, and I was particularly enthralled by the dressing on each bite. Each piece of nigiri had a dollop of wasabi hidden between the fish and the rice, and each slice of sashimi sat in a small puddle of ponzu, yuzu, or other brightly acidic sauce. With food this fine, you only need one bite. Of our 15 courses, there was not one I wouldn’t recommend. But, I was surprised that the most memorable were not the fish, eel, or perfectly cooked beef. When I tell people about o ya I gush about the homemade La Ratte Potato Chip with Summer Truffle and the Warm Braised Shiitake Mushroom with Truffled Honey. 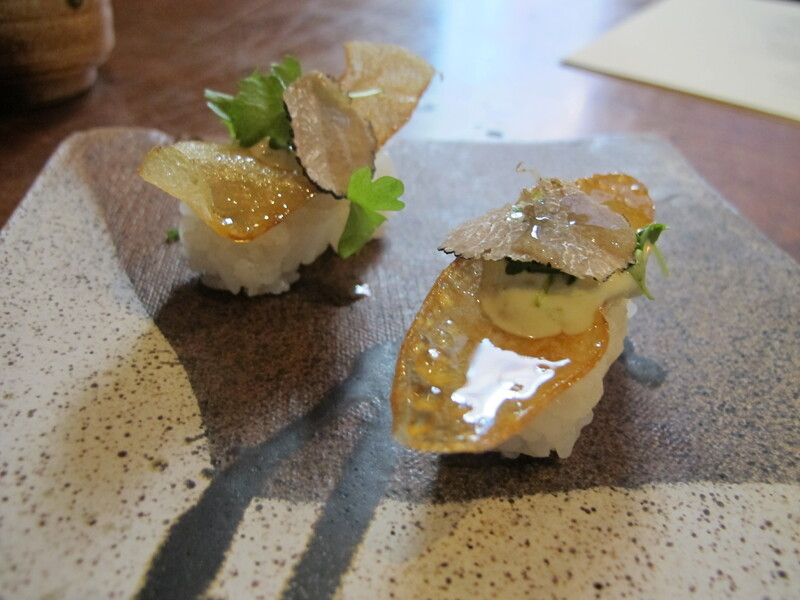 Both had a combination of salty, sweet, and pungent that denotes the chef’s true understanding of flavor. About halfway through dinner there was a lull in our service, but just when I was getting antsy I realized the waiter was giving us a break to digest and enjoy, and with good reason. Our last course, aged port-sake and Foie Gras with Balsamic Chocolate Glaze deserved to be enjoyed without the hindrance of a groaning belly. When I made our reservation for o ya, all I could snag was 6:15pm at the chef’s counter – no table vacancies, even months in advance. Knowing how many accolades the place has received (Best New Restaurant, Best Chef, Top Ten Sushi Restaurant in America, Best Restaurant in Boston, etc. ), I wasn’t surprised that I needed to plan in advance, but I was suspicious of what the atmosphere would be like. Would the staff be pretentious and make me feel out of place (*cough* Craigie Street Bistro), or would they be welcoming and sincere? 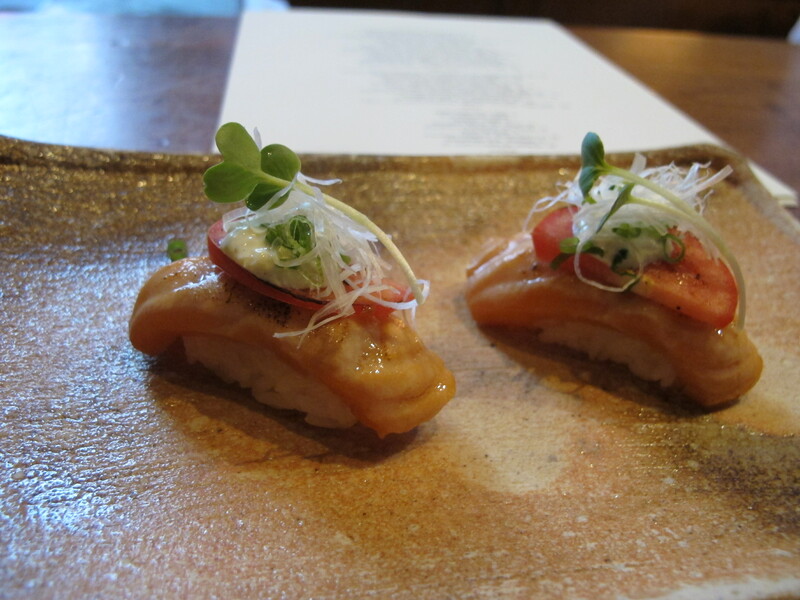 At o ya, the host, servers, and chefs were all kind, low key, and genuinely enthusiastic. Our fellow patrons, however, were not. I was a bit taken aback when I sat down next to a duo who appeared to be getting engaged, or were at least celebrating some jewelry-heavy milestone. The gentleman presented not one but two ring-sized boxes, and the pair appraised the contents with the bored air of people so moneyed they could bleed Tiffany blue. On the other side of the bar sat two couples intent on out doing each other’s high-end food escapades. “Oh, we used to love Barbara’s restaurants,” said one woman, “but they’re getting so crowded.” The man from the other couple pouted: “We were just so disappointed in L’Espalier last week.” I didn’t have the heart to tell him that the “r” is silent in L’Espalier. But despite the overly entitled diners (or maybe because of the excellent people watching), dinner at o ya was everything I hoped it would be. If we can get another reservation sometime this century, I will happily stare at a brick alley for hours, if only for one more bite of those truffled potato chips.